Two decades ago, a black trans woman by the name of Rita Hester was stabbed multiple times in her first-floor apartment in Boston, Massachusetts. The police arrived at her apartment to find her in cardiac arrest. She was pronounced dead after she was transported to a local hospital. Two decades later, Rita Hester’s death has yet to be solved. At the time, I was operating an online forum for transgender people on America Online. The web was only starting to gain popularity, and many people on the internet still used commercial services like AOL and CompuServe. Talking with others in the forum’s chat room, The Gazebo, I brought up the Rita Hester murder. As we discussed the death, I noted how similar Hester’s death was to another anti-transgender murder that took place three years prior, that of Chanelle Pickett. It’s not to say that these two deaths were actually linked, as the murderer of Pickett, William Palmer, was in jail at the time of Hester’s murder. Nevertheless, I noted that both were trans women of color, both had gone out to a bar before heading home, both were in Boston, and both were killed near the end of November. The others in the room — including two members from Boston — had never heard of Channel Pickett. This shocked me: while it had been three years since Pickett’s murder, the trial had only wrapped up less than a year and a half prior, and had received a fair amount of local media coverage. In that moment, my own community was living that quote: we were forgetting the people we had lost due to anti-transgender violence, and opening the door for future death. A week or so later, I released a website called Remembering Our Dead. The original site chronicled roughly 30 cases of anti-transgender violence over roughly a decade. This site led myself and Penni Ashe Matz, a Boston-based trans activist, to hold an event in our cities one year after Hester’s murder. 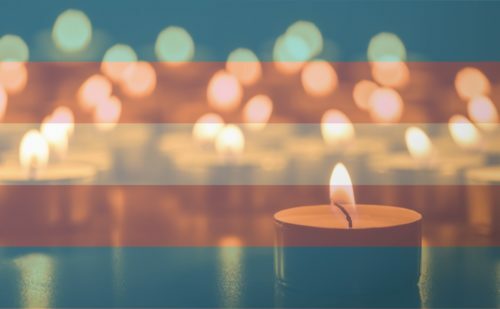 That was the first Transgender Day of Remembrance. The project started because our deaths were forgotten. Today, it is a time to remember those we’ve lost, and bring attention to the issue of anti-transgender violence. It is a time to reflect and mourn. It’s a sacred day for those we have lost, and for the resilience of a community that no longer forgets.